Rider University will host the 2015 Minding Our Business (MOB) Business Plan Competition on Wednesday, July 29th from 6-9 PM in the Sweigart Hall Auditorium. The competition will feature 25 participants, ages 11 to 14, from Mercer County public schools, as part of the MOB Summer Program. During the program, participants receive 20 days of training on how to plan and run a business. By the end of their training, all students in the program are required to produce a plan for their business idea. On July 29, the students with the 10 best plans will compete for top money awards. These young contestants will certainly impress you! Not only are they presenting well-formulated business plans, but they will do so in a professional manner. The MOB Summer Program is recognized by the National Summer Learning Association (NSLA) as a high quality program for low-income youth. Two years in a row MOB was a finalist in the running for the Summer Excellence National Award by NSLA. MOB is an effective program in preventing summer learning losses and reducing the achievement gap. Beyonce Layne – A Success Story! 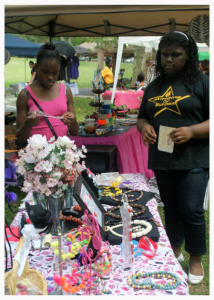 This is a photo of Beyoncé Layne running her business “Sparkles & Sparks”. As a friend of MOB I invite you to continue to “build a bridge to the future” for low-income Mercer County youth like Beyoncé. You can do so by becoming a sponsor of the 2015 Minding Our Business Plan Competition. Only 20 percent of Trenton School District 7th graders were math proficient in 2013. Throughout the MOB training students improve their achievement in math and business math. Beyonce Layne, one of our 7th graders, is one of our math success stories. Initially she struggled with math but with the help of our business math teacher and tutors quickly became proficient and excelled. She was the student with the highest business math score by the end of the training. Math is now one of her strongest subjects in school and she now takes the lead in answering difficult questions from her math teacher. Beyonce has shined as a young entrepreneur with her business “Sparkles & Sparkz” marketing her handmade jewelry. She was the winner of the 2013 and 2014 Minding Our Business Plan Competition. By supporting the MOB Business Plan Competition you’re contributing to the success of many other students like Beyonce. How is the money going to be used? To pay for scholarships for students from low-income families. The program cost per student is $2,500. Most low-income pay a small fraction or pay nothing at all.